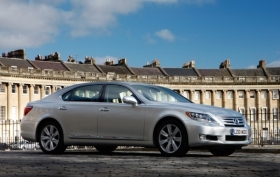 Customers have complained about turning problems with models such as the LS 600h, shown. TOKYO (Bloomberg) -- Toyota Motor Corp. is preparing to recall 11,500 Lexus vehicles worldwide for problems related to steering. The company plans to recall 7,000 vehicles overseas, including 3,800 in the U.S., and 4,500 units in Japan, said Mieko Iwasaki, a spokeswoman for the carmaker. Toyota is recalling four Lexus models, the LS 460, LS 460 L, LS 600h, and LS 600h L.
The cars were sold in the United States, Europe and China and in Japan. In Japan, customers have complained about wheels not returning to original positions fast enough after making turns, Iwasaki said. The problem is both mechanical and software-related, she said. Separately, Toyota said last month it will recall the Lexus GX 460 sport-utility vehicle that Consumer Reports magazine rated a “safety risk” because the model can roll over in certain driving conditions. About 13,000 GX 460s were repaired, including 9,400 in the U.S. and the rest in countries including Russia, Oman, Saudi Arabia, the United Arab Emirates and Canada, according to the automaker.